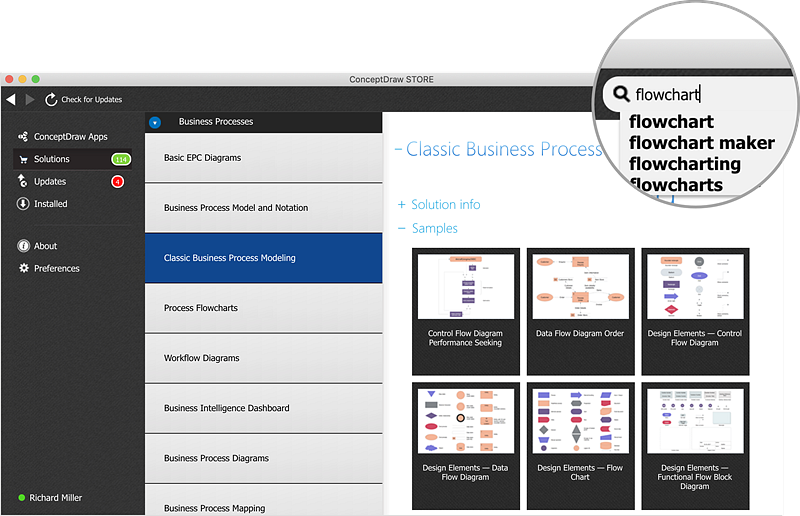 ConceptDraw Solution Park is an online collection of professional solutions for knowledge workers that are designed to find and install product extensions for ConceptDraw products. These product extensions install templates and extra functionality to ConceptDraw products. STORE is a tool for exploring Solution Park. You can search for solution type or specific samples and templates to find the solutions that are best suited for your business needs. Enter your query into the search box. Select one of the solutions, displayed on the middle pane, to see on the right pane its description and the list of samples, templates and libraries available with the current solution. Click the sample, template, or library preview to open them. ConceptDraw Solution Park delivers high quantity big and small solutions that can benefit your business. It contains number of solutions that supports various issues and can help you to solve your particular tasks. 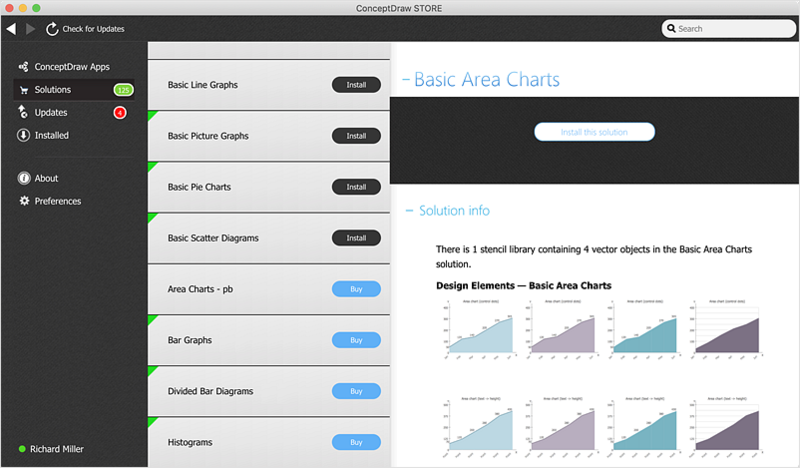 The ConceptDraw product line is known for constantly adding value to its products. Also, included with ConceptDraw products is the Solutions, offering even more value in the form of free and paid high–performance solutions, accessed via the ConceptDraw STORE. The new edition of some Solutions extends dramatically the current set of vector libraries, samples, and templates for some solutions, these now available at a charge. Follow the links below to download the free versions of the solutions that were available for ConceptDraw DIAGRAM. Then, you need to extract the zipped solution to the proper location on your computer.